Description: In some of the church's history, Scripture has been pitted against tradition and vice versa. Prominent New Testament scholar Edith Humphrey, who understands the issue from both Protestant and Catholic/Orthodox perspectives, revisits this perennial point of tension. She demonstrates that the Bible itself reveals the importance of tradition, exploring how the Gospels, Acts, and the Epistles show Jesus and the apostles claiming the authority of tradition as God's Word, both written and spoken. Arguing that Scripture and tradition are not in opposition but are necessarily and inextricably intertwined, Humphrey defends tradition as God's gift to the church. She also works to dismantle rigid views of sola scriptura while holding a high view of Scripture's authority. 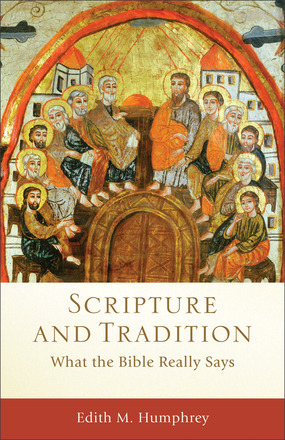 Citation: Nijay Gupta, review of Edith M. Humphrey, Scripture and Tradition: What the Bible Really Says, Review of Biblical Literature [http://www.bookreviews.org] (2014). Citation: Richard S. Briggs, review of Edith M. Humphrey, Scripture and Tradition: What the Bible Really Says, Review of Biblical Literature [http://www.bookreviews.org] (2013).